Lattner starred in both football and basketball at Fenwick High School where he graduated in 1950. Fenwick, along with other Chicago-area Catholic schools, was a breeding ground for Notre Dame and Big Ten football programs, and Lattner held offers from top college football programs across the country. He initially considered the University of Michigan because head coach Bennie Oosterbaan ran the single wing offense, a scheme that fit Lattner well at Fenwick. Lattner eventually chose Notre Dame, which offered a Catholic education and the highest level of competition. Lattner played halfback for the University of Notre Dame under head coach Frank Leahy from 1950 to 1953. He won the Heisman Trophy in 1953, and won the Maxwell Award twice, in 1952 and 1953. In 1953, the Irish went 9–0–1, finishing second to Maryland in the final Associated Press poll. Lattner rushed for 651 yards (averaging 4.9 yards per carry) and scored nine touchdowns, caught 14 passes for 204 yards, had four interceptions and tallied two touchdowns on only 10 kickoff returns. Lattner appeared on the cover of Time Magazine on November 9, 1953 with the caption "a bread and butter ball carrier", a phrase bestowed upon Lattner by Leahy. In 1954, Lattner was drafted in the first round by the Pittsburgh Steelers, but played with them for only one season before entering the United States Air Force for two years. There, during a football game, he suffered a severe knee injury that prevented him from ever playing professional football again. Lattner's single season in Pittsburgh was a success, as he totaled over 1,000 all purpose yards on offense and special teams. As a result, he was named to the NFL 1954 Pro Bowl as a kick and punt returner. Lattner coached for a period in the late 1950s, at St. Joseph's High School in Kenosha, Wisconsin and the University of Denver. His coaching career ended in 1961 when Denver cut its football program. Lattner was elected to the College Football Hall of Fame in 1979. An Oak Park resident for most of his life, Lattner later lived in Melrose Park, Illinois and resided in Anna Maria Island, Florida during the winter months. He served as vice president of sales at PAL Graphics Inc. in Broadview, Illinois. 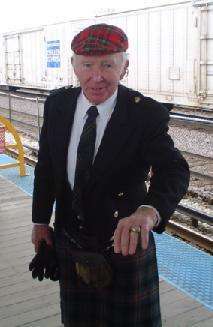 Of Irish Catholic descent, Lattner was a longtime participant in the Chicago Saint Patrick's Day Parade, often carrying the banner of Saint Patrick. The Chicago Tribune noted that nobody "out-Irished" Lattner, who also sports a kilt and green stockings for the festivities. In 1962, Lattner opened Johnny Lattner's Steakhouse on Madison Street in Chicago. An electrical fire in 1968 severely damaged the restaurant and claimed three lives. Lattner's Heisman Trophy was on display in the restaurant and was destroyed in the fire. Lattner sent the Downtown Athletic Club a check for $300 along with newspaper coverage of the fire and received a replacement. A fire four years earlier had ended better for Lattner. While driving home from work in the early morning of November 17, 1963, he spotted a fire in an apartment building on the West Side of Chicago. He called the fire department, then roused 25 residents from one of the buildings and carried a five-year-old girl to safety. He was credited with helping 40 people escape injury. He operated a second restaurant at Marina City from 1968 to 1972. Lattner routinely rented out his Heisman Trophy to tailgates and other events with the proceeds donated to charity. At halftime during Fenwick's 2007 game versus Hubbard at Soldier Field, Lattner's #34 jersey was retired. Lattner had 25 grandchildren, several of whom have also played football for Fenwick High School. Robert Spillane, a class of 2014 graduate, plays football at Western Michigan University. Another grandson, Ryan Smith, also graduated from Fenwick in 2014 and plays football for Miami University. Lattner was 83 when he died from mesothelioma in his Melrose Park, Illinois home on February 12, 2016. ↑ John J. Lattner '50 (biography) – Fenwick High School Online Community. 1 2 3 4 5 6 "John Lattner". Espn.go.com. 2011-10-28. Retrieved 2016-02-16. 1 2 "Johnny Lattner Bio :: Notre Dame Football :: UND.COM :: The Official Site of Notre Dame Athletics". Und.com. 2015-04-30. Retrieved 2016-02-16. ↑ "TIME Magazine Cover: John Lattner - Nov. 9, 1953". Time. ↑ "1954 NFL Pro Bowlers". Pro-Football-Reference.com. Retrieved 2016-02-16. ↑ "Lattner Appointed Assistant Coach". The Gettysburg Times. July 16, 1959. p. 4. Retrieved December 21, 2014. ↑ "Lattner wins Heisman". Today in ND History. Retrieved 2016-02-16. ↑ "It's Sure To Be A Fine Parade On St. Pat's Day, Begorra". Chicago Tribune. March 17, 1989. ↑ Dold, R Bruce (March 18, 1986). "St. Pat's Day Afloat In Politics". Chicago Tribune. 1 2 3 "Johnny Lattner: Still fourth and goal - Loop North News". Marinacityonline.com. Retrieved 2016-02-16. ↑ Lattner's jersey retired, chicagotribune.com, August 24, 2007. ↑ "Spillane carries Lattner tradition at Fenwick". CSN Chicago. 2012-10-30. Retrieved 2016-02-16. ↑ Helfgot, Mike (September 14, 2013). "Sunday special". Chicago Tribune. ↑ Farmer, Marty. "Fenwick legend Johnny Lattner dies at 83," Wednesday Journal (Oak Park, IL), February 17, 2016.